Since it's almost Easter Sunday, I will be sharing with you several cool virtual Easter eggs hidden inside some of our favorite software applications. 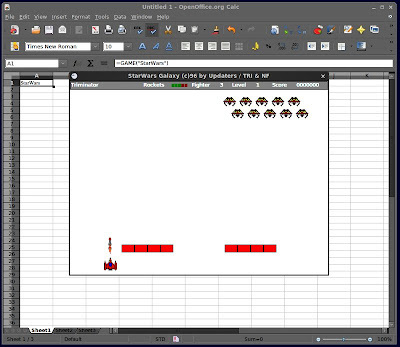 Today, we will take a look at some Easter eggs inside OpenOffice.org so get ready to have fun or be amused. OppenOffice.org Calc has a few hidden games inside. 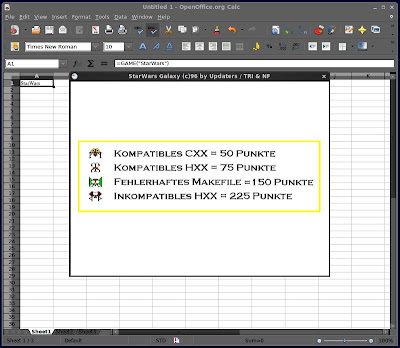 You can try them by opening a new Calc spreadsheet, and then entering some characters into a cell. To play Space Invaders, enter =GAME("StarWars") into any cell and press the ENTER key. It you have closed the game and you try to play it again, the message "oh no, not again" will appear. 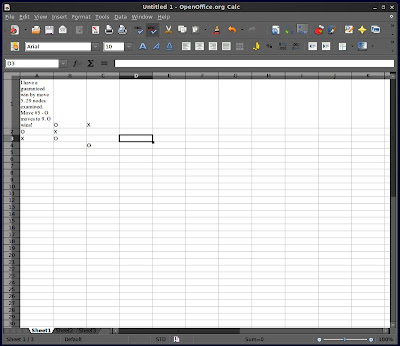 You can play again by restarting OpenOffice.org Calc. The instructions are in German but you don’t have to understand them to start playing Space Invaders. Use the Spacebar key to shoot and the left-right arrow keys to move. The graphics is not pretty but the game can still be fun to play and can be a nice break after long hours of staring at numbers. To play Tic-Tac-Toe, enter =GAME(A2:C4;"TicTacToe") formula into A1 and press the ENTER key. There are also other interesting OppenOffice.org Calc Easter eggs, like when you put =ANTWORT("Das Leben, das Universum und der ganze Rest") into any cell and pressed the ENTER key, the result is the famous number 42 from the Hitchhiker's Guide to the Galaxy. 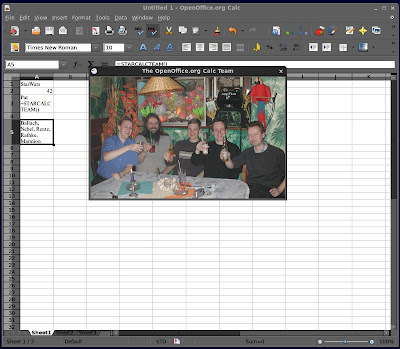 You can also check out a photo of StarCalc developer team getting drunk by entering =STARCALCTEAM() into any cell, and then pressing ENTER. To view a photo of the StarWriter developer team, enter the word StarWriterTeam into a Writer document, and then press F3. To view a picture of the GoOOTeam developer team, enter the word GoOOTeam into a Writer document, and then press F3. 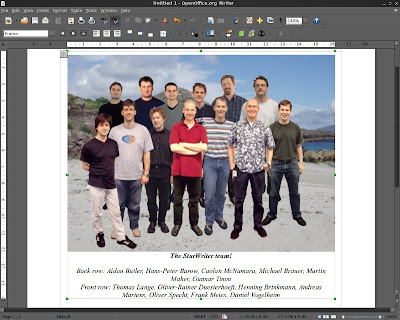 You can check out the full list of OpenOffice.org Easter eggs HERE. I will be posting more virtual Easter eggs in the following days so watch out for it. Also, your calc is using very pretty theme, what is it? It's nice to know that some dev. teams are still putting eggs in their programs for everyone to discover. thanks again for the great post. This is all very well, but what percentage of the download file size / size on disc / time to load the program does this stuff account for? And how many of the bugs? Is there an anti-spam program that will strip it out? Sure, an easter egg can be nice, but is also quickly akin to unprofessional and bloat, two things that I think do no good to OpenOffice.org. After 20 years,shouldn’t they slow down on the insults from past wastes.